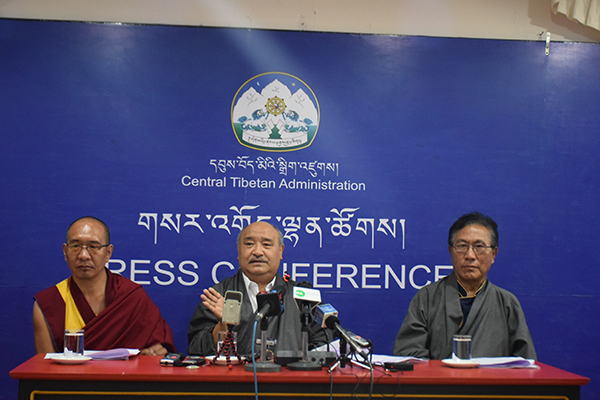 In the run-up to the 2016 elections among the Tibetan community in exile, the Election Commission (EC) of the Central Tibetan Administration (CTA) has issued a code of conduct that must be observed during the elections to the post of Sikyong (Tibetan political leader) and the Tibetan Parliament in-exile (TPiE). The 2016 elections assume enormous significance for the current Kashag (Tibetan cabinet) headed by Sikyong Lobsang Sangay, considered the first political leader of the Tibetan people after the Dalai Lama devolved his political power to an elected leader or Sikyong during the 2011 elections. The EC is the autonomous apex body of the CTA with a permanent office headed by the Chief Election Commissioner (CEC) along with regular staff members in Dharamsala, India. The appointment of a CEC is approved by the TPiE. The code of conduct issued by the EC on 15 July 2015 expands on and supplements provisions of an already existing Rules and Regulations of the EC. The Code mostly concerns any cases of the violation of the provisions under article 24 of the Rules and the penalty imposed under article 25. 1(b) Any attempts to pressurize [some one] to vote and not to vote; if such violations are found, they shall be considered serious violations [of the code of conduct] and the punishment shall be that votes of such persons shall be declared null and void, and the offender shall be stripped off the right to [stand] as a candidate and the right to vote. 2. Any one who attempts to forcefully threaten a candidate or a voter, threatens to withdraw his or her candidacy, or intervenes in or obstructs a voter’s right to and right not to vote; if such violations are found, the person who commits such violations shall be stripped off the right to vote for ten years. 3. Any candidate or an opposing candidate or any person—prompted by the intention that [the opposing candidate] does not win the elections—indulges in ad hominem attacks, makes baseless allegations, criticism or subject [him or her] to humiliation, indulges in provincialism, sectarianism, creates conditions that would lead to conflicts within the society through sowing dissension, such violations [of the code of conduct] shall be considered serious cases; and as such, all the votes of the candidate [responsible for such violations] shall be declared null and void, and the opposing candidate, and any person [committing such violations?] shall be stripped off their right to vote in any official elections. 4. Any candidate, an opposing candidate, or any person who appeals for support [needed] to benefit or harm the activities/campaigns of the elections; to such a seeker of support [in benefit of such person?] if any government official in general, and particularly if any official of the election commission uses their position/power, if such violations are found, the punishment shall be: for the moment the official shall be recommended to transfer [to another place] and dismissed from election responsibilities. 5. If any candidate, by assembling huge public for the purpose of election activities [campaigns] and spreading wrong information or campaign literatures, if such violations are found all the votes received by [the offending] candidate shall be declared null and void. 6. All the staffs of central Election Commission, and the local election commissions, if any secrets regarding elections are required to be kept, they must keep it by not revealing them to the public; they must show ways to keep the secrets, rather than revealing them to their relatives, friends or fellow Tibetans from the same province or religious sects; they must ensure that no information/literatures should be exposed outside; if such things occur, he or she shall be dismissed from his or her official positions. 7. However, in accordance with the rules and regulations of the Election Commission—that is without contradicting them—at the public gatherings if the candidate takes a particular political ideology, if any announcement made to the public with regard to accepting responsibilities, distributing literatures, the candidates’ province, religious sects, organization, any declaration of support by individual or organization; if any person is declared, through suggestions made both verbally and in writing, worthy of being elected as an MP, all issues that are related to these aforementioned points shall not be considered as violation of the laws and regulations. However, within two days before the day of the election until the end of elections, all declarations of support must cease. If such violations are found, the punishment shall be that all the votes that a candidate received from that particular area shall be declared null and void; the particular head of the organization or the particular individual shall be stripped off his or her right to vote for five years in any official elections. 8. From the day of the announcement of the elections, any candidate desiring to fight the elections for the post of Sikyong, Kalon or MP, if they participate in election debates organized by the CTA or other NGOs, they must do so in their own personal capacities rather than as representing the CTA; moreover, they can’t seek services of any CTA officials nor can they use the finance and other materials of the CTA; even while they are on official visits, they are not allowed to make any campaigning speeches; if any candidate is found doing such a thing in any place, the punishment shall be that votes received for the candidate in that place shall all be declared null and void. a) Regarding campaign expenses of Sikyong and MPs, all the candidates should abide by the rules of the Election Commission. The maximum expenditure allowance for each Sikyong candidate is eight lakh Indian rupees (Rs. 800,000) whereas the maximum expenditure allowance for each MP candidate is three lakhs Indian rupees (300,000). All the funds incurred on any campaign should be legal. The campaigns include publishing one’s opinions in the new papers in exile, making different posters, distribution of pamphlets and CDs, addressing one’s opinions on public gatherings, announcements and advertisements in websites and social networks. If there is any evidence of spending beyond the expenditure limit set by the Central Election Commission, 25 votes for each 10,000 rupees extra spent used shall be declared null and void. If there is any proof that the fund spent is illegal, all votes secured by the respective candidates shall be declared null and void. a (1) Excluding organizations and institutions recognized by CTA, no independent organization or individual is allowed to carry out any announcement or spent on campaign activities. The expenses incurred in any permitted campaign should be included in the account statement of the concerned candidate. If there is any evidence that any individual violates this guideline, he/ she shall not be allowed to vote for any of the CTA elections for a term of five years. However, any campaign without any expenditure shall not be included here. a (2) Each candidate should submit all the statements of receipt and expenditure related to election campaigns to the Regional Election Commission before the official declaration of the election. If any Sikyong/parliamentarian candidate does not submit all the statements of receipt with attestation before the official declaration of the actual election, 10% of the votes received by the respective candidate shall be deducted. a (3) All the campaigning literatures, pamphlets and posters of each candidate of Sikyong and MP should contain the name and address of publishers and distributers. If there is any evidence that any candidate violates this guideline, he/ she shall not be allowed to vote for any of the CTA organizations for a term of five years. a (4) None of the Sikyong and MP candidate is allowed to use any portrait of His Holiness the Dalai Lama and emblem of CTA on their campaigning literature. Using Tibetan national flag and Tibet map is also prohibited. If there is any evidence that any candidate violates the fifth guideline, 5% of the votes received by the respective candidate shall be declared null and void. a (5) Each Sikyong and MP candidate and their supporters can participate in election campaigns for preliminary election as well as for the final general election, but these should be done in accordance with article 24 of the Election Rules and Regulations. Moreover, they should abide by the article 24 (7) of the Rules and Regulations of the Election commission, states that: “All the campaigns should cease two days before the election dates.” Any direct, indirect or incidental act of distributing campaign literatures to voters on voting dates shall not be allowed. If there is any evidence that any candidate violates this guideline, he/she shall be given the punishment elucidated article 24 (7) of the rules and regulations of the election commission. In addition to that, he/she shall not be allowed to vote for any of the CTA elections for five years. a (6) All the campaign programs and activities at any place should be abided by the laws of the concerned country. Distribution or pasting of photos of the candidates in politically sensitive areas is not allowed. If there is any evidence of violating this guideline, the candidate shall not be allowed to stand for the election for the same post for five years and other individuals shall not be allowed to vote for any of the CTA elections for five years. a (7) All the information related to election campaigns including publication of announcements, press conferences, and distribution of documents by the candidates or their supporters should be sent to the concerned Regional Election Commission for their awareness. If any candidate or his/her supporter violates this guideline, the concerned Regional Election Commission will halt the campaign activities of the respective candidate. The Tibetan Centre for Human Rights and Democracy (TCHRD) will launch a series of awareness-raising advocacy campaigns aimed at increasing actual voter turnouts particularly among the Tibetan youth during 2016 elections, and to give due prominence to the unique practice of the stateless and borderless democracy created and practiced by Tibetans in exile. A multi-media presentation on 2016 elections featuring roundtable discussions and spot-on interviews with Tibetan university students; a 30-minute documentary film on Tibetan democracy; and organizing visits by international observers to at least three constituencies in and around Dharamsala. DISCLAIMER: Translation of provisions of the Rules and Regulations of the EC included in this briefing has not been approved of by the EC. If any discrepancies are found, consider the Tibetan version as authoritative and final.